Mitsubishi Motors Corporation remains convinced of the virtues of motor sports to improve the breed and whilst the glorious days of the Dakar Rally and the World Rally Championship are long gone for Mitsubishi, the achievements of the innovative i-MiEV Evo electric monoposto racer at Pikes Peak still prove the point – especially for pioneering technologies. In the case of the bigger SUV/crossover Outlander, cross country was deemed better suited – more so as it would be an unusual showcase for Outlander PHEV and its unique Plug-in Hybrid Electric drivetrain. A pre-production Outlander PHEV was entered in the 2013 Asia Cross Country Rally (or “AXCR”) which took place August 10th – 16th between Thailand and Laos, post-event celebrations starting today in Japan. An officially FIA sanctioned race, the AXCR is an Asian take at a Dakar-type of extreme cross country rallying, which started this year from Pattaya and finished in Pakse, in the southern part of Laos. 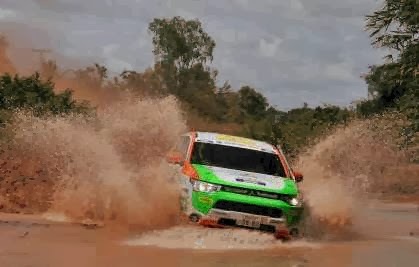 Over 6 days, competitors drove over 2,000km on various road surfaces and conditions including mountain roads, muddy jungle, river crossing, etc,…, making it a true challenge in terms of driving performance and endurance. Out of a total of 20 entries in the four-wheeled category (of which 19 finished), the Outlander PHEV attracted quite some attention as it was the only plug-in hybrid vehicle to participate, most competitors behind heavy-duty Diesel-powered pickup trucks. Completing such a tough rally with no problem whatesoever confirmed the durability as well as the dynamic performance of Outlander PHEV just a few months before it starts its commercial career in world markets. Mitsubishi will launch Outlander PHEV sequentially, starting with selected PHEV markets (The Netherlands, Nordic countries, etc,…) from October 2013 onwards. The other European markets will gradually follow from November 2013 to Q1 2014.